In the half-century since the Kerner Commission’s report on urban unrest, South Los Angeles has experienced little economic progress, according to a new study by the Center for Neighborhood Knowledge, part of the UCLA Luskin School of Public Affairs. “South Los Angeles Since the Sixties” is part of a year-long research project that began in Spring 2017. The project focused on important dimensions of inequality – housing, employment, education, and transportation – and examined how they evolved over the last fifty years in South Los Angeles and Los Angeles County. The report was published on February 28 2018, coinciding with the 50th anniversary of the publication of the National Advisory Commission on Civil Disorder’s findings (i.e. the Kerner Report). The Kerner Report, along with the McCone Report published in 1965, sought to uncover the causes of widespread unrest sweeping the nation, revealing them to be demonstrations of anger at persistent racial prejudice and inequality. The two reports provided the backdrop against which to evaluate how far we have come and how far we have yet to go toward remedying the issues raised. We chose to focus on South Los Angeles because it was a focal point for protests in the 1960s, and continued to be marginalized, leading it to be the main site of revolt in 1992. 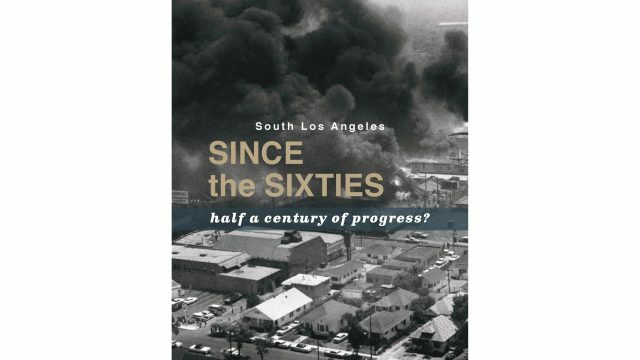 “South Los Angeles Since the Sixties” seeks to illuminate, using quantitative data, the circumstances under which these violent protests took place and what progress had been made, if any, since then. The results point to persistent disparities with few areas of progress. However, it is important to acknowledge that these results capture only one dimension of inequality. Community mobilization, in particular, has done much to create a more just South Los Angeles. In 1960, South L.A. workers made 80 cents on the dollar compared to the average Los Angeles County worker. In the last 50 years, that gap has widened. Today, the average full-time, full-year worker in South L.A. earns about 60 cents on every dollar earned by the average county resident. “This report is a sobering snapshot of the inequalities that have persisted in South Los Angeles fifty years since the 1968 report,” said Paul Ong, Director of the Center for Neighborhood Knowledge. Disparities in earnings are the main driver of income inequality. Earnings are critical in overall quality of life — low earnings can translate into less access to necessities, amenities, and opportunities. Earnings in South L.A. have failed to catch up to county levels, according to the researchers. That widening pay gap is driven in part by a steady decline of male wages. South Los Angeles is home to 722,000 persons, and epitomizes the plight of inner-city neighborhoods. It is the site where frustrations of a marginalized and neglected community boiled over in 1965 (Watts Riots) and 1992 (Civil Unrest). These reactions to the lack of progress should not have been unexpected given the realities documented by this report. Homeownership, the principal mechanism for wealth accumulation for middle-class residents, is lower in South L.A. than the county and has declined over time. Today, fewer than one in three South L.A. residents own their home. The high demand for housing has translated not only to higher cost but also higher home values. After adjusting for inflation, the average home is priced at nearly three times as much today as it was in 1960. This places financial strain on new buyers and puts ownership further out of reach for renters. Car ownership is critical in Los Angeles where, despite large investments in public transit, lacking a car can severely limit one’s access to job and educational opportunities. Availability of cars within households has improved over time; nonetheless, households in South LA are twice as likely to lack a car, according to the study. South LA residents remain three times as likely to rely on public transit for commuting. Educational attainment is critical in preparing children to be successful and productive adults. However, public schools have continued to be “separate and unequal.” Elementary school performance on standardized testing reveals persistent gaps between South LA and the most affluent neighborhoods in West L.A. Early childhood preparation can be critical toward the goal of fostering successful students. Fifty years ago, recommendations concerning education specifically prioritized the expansion of preschool programs. In 1960, preschool enrollment was virtually non-existent in both South L.A. and the county. In 1990, children in South L.A. were only half as likely as county children to be enrolled in a private preschool. This can be taken as an indicator of the wide gaps in the availability of resources for education to residents in South L.A. compared to the county. This gap has grown since then. In 2016, county children are four times as likely as South L.A. children to be enrolled in a private preschool. There are no definitive boundaries for South Los Angeles. Over time, the boundaries have shifted as the neighborhood has changed. This study is based on public use microdata areas (PUMAs), which are defined by the U.S. Census Bureau. These are reasonable approximations of the curfew area for the 1965 Watts Riot, the post-1992 Civil Unrest Rebuild L.A. zone, and the Los Angeles Times Neighborhood Mapping Project’s South Los Angeles area. All data, with the exception of school performance, come from PUMS samples. The 1960 data are extracted from IPUMS. Additional data come from tract-level statistics reported by the U.S. Census Bureau. Data on elementary school performance combine assessment scores from California’s Standardized Testing and Reporting with historical information of schools, reported in the 1965 McCone Report.